With a population around four million, Melbourne is the food and shopping capital of Australia. The city centre is an intriguing mixture of broad boulevards and small laneways and arcades. There is a dynamic music and theatre presence while the National Gallery of Victoria contains an impressive collection of European and indigenous Art. Nearby are the outstanding Royal Botanic Gardens and sporting facilities, including the Melbourne Cricket Ground. Outside the city are sandy beaches, rugged coasts and popular wine regions (over 170 wineries within 90mins of the city). 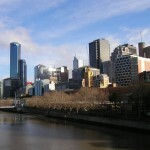 The convention centre is located on the opposite side of the Yarra River from the Melbourne CBD, which is about a 15min. stroll away. Here you will find large department stores and boutiques offering possibly the best shopping experience in Australia. Perhaps more interesting to visitors are Melbourne’s laneways and arcades, offering an amazing variety of small shops and cafes. Also there are many historic buildings, Chinatown and Federation Square opposite Flinders St Railway Station. Along the same side of the river as the convention centre are various hotels, an entertainment complex with a casino and the arts centre precinct containing the National Gallery of Victoria under an impressive spire. Also nearby is the Skydeck, Melbourne’s highest lookout, and the Melbourne Aquarium. In the other direction is Yarra’s Edge, a new shopping complex. Across the river and two short blocks away is the Southern Cross Railway Station, which is also the terminal for bus transport to and from the Airport. Nearby is Docklands, offering waterside walks and more shopping. The following listing is an indication of some activities which you may care to undertake during your visit to Melbourne. City Circuit Tourist Tram (free): At Flinders St., near Spenser St.
River boats at Echuca and Mildura on Murray River.